OmronYou are currently viewing the E5EC-T page. The E5_C-T Ramp/Soak temperature controllers expands the E5_C family to handle process applications. 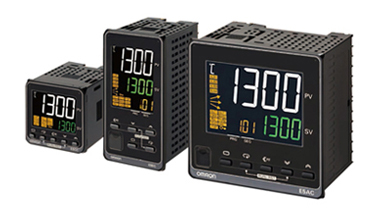 Capable of handling up to 6 event inputs and up to 4 auxiliary output all in a compact 60 mm (depth) housing, makes this controller series one of Omron's most powerful and versatile temperature controllers. 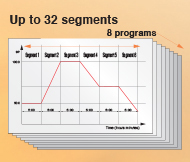 Set up to 8 programs with 32 segments totaling 256 program segments simply via CX-Thermo software. The three-level display is visible simultaneously so each process status can be easily identified. "Segement Jump" allows users to easily move directly to the specified segment reducing programming time and increase production throughput. 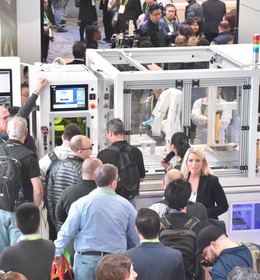 Applying less stress to valuable objects due to reduced temperature overshot (step response) and precise regulation in terms of disturbances, is our recipe for best processing results providing the added value for machine/object. Ramping and soaking can be fluently executed without the need for adjusting parameters manually. Even if there are changing process characteristics, the powerful auto-tuning quickly leads the user to a stable operation, overtaking PID settings automatically. Setting-up temperature profiles is made easy by using CX-Thermo Software which is applicable for the whole E5_C Platform. This tool helps to visualize and track the process in diagrams or log data on an external host with Windows operation system. Providing the relevant PV/SV values on the largest display in its class on the Global Market*, with outstanding visibility and contrast. 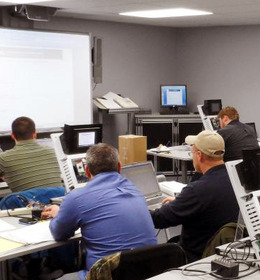 Even under severe ambient lighting conditions E5_C can be read from a far distance. Due to its modern ergonomic design (IF Design award) the E5_C can optically be integrated into every panel. Additional information about the executed program and operating segment can be seen at a glance. The E5_C series can be easily connected, set-up and operated in only a few steps using the instrument’s 5 front keys. 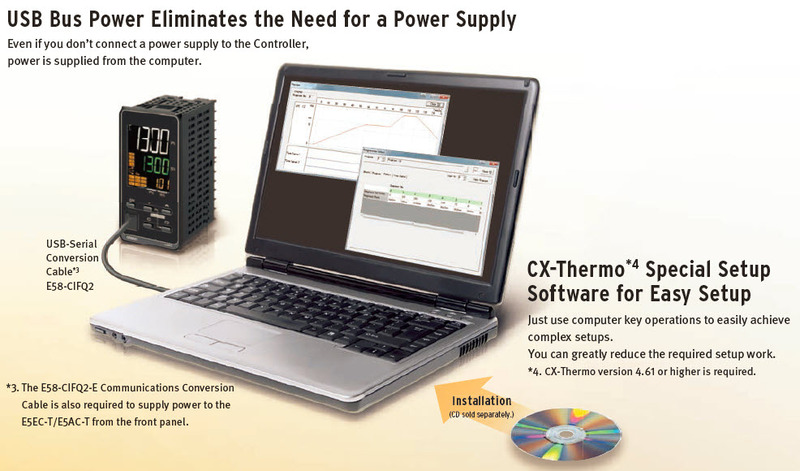 The CX-Thermo software and useful navigation assistant for intuitive settings allows for a very quick parameter setting, easier device adjustment and simpler maintenance. For many years our goal is to assure best regulation performance in temperature control. Following the patented 2-PID algorithm, integrated in almost every Omron controller, the same recipe can be found in the “T”-Programmer family. 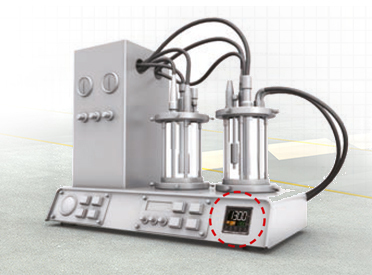 Combined with a unique control loop time of 50 ms and 0,1 °C of resolution, E5_C-T is the best partner for saving time in terms of quick disturbance response while keeping high precision in regulation of temperature. As the design of machines is continuously moving into high speed requirements, our controllers have already adapted to these tendencies. You can output an alarm when the deviation, process value, set point, or manipulated value reaches a specified value. You can also output alarms for the PV rate of change and for loop burnouts. If necessary, a more comprehensive alarm function can be achieved by setting a standby sequence, alarm hysteresis, auxiliary output close in alarm/open in alarm, alarm latch, alarm ON delay, and alarm OFF delay. With models with the optional HB and HS alarms, you can detect heater burnout and heater short alarms based on CT inputs. You can output an integrated alarm if a standard alarm, HB alarm, or HS alarm turns ON. Changing programs (changing program number, 8 max. ), changing between run and reset status, changing between automatic and manual operation, inverting direct/reverse operation, changing between program SP and fixed SP, 100% AT execute/cancel, 40% AT execute/cancel, 100% AT execute/cancel for all PID sets, 40% AT execute/cancel for all PID sets, setting change enable/disable, communications write enable/disable, canceling the alarm latch, hold/clear hold, advance, and wait enable/disable. With any E5_C-T model that supports communications, you can use CompoWay/F, Modbus-RTU,*1 programless, and component communications. 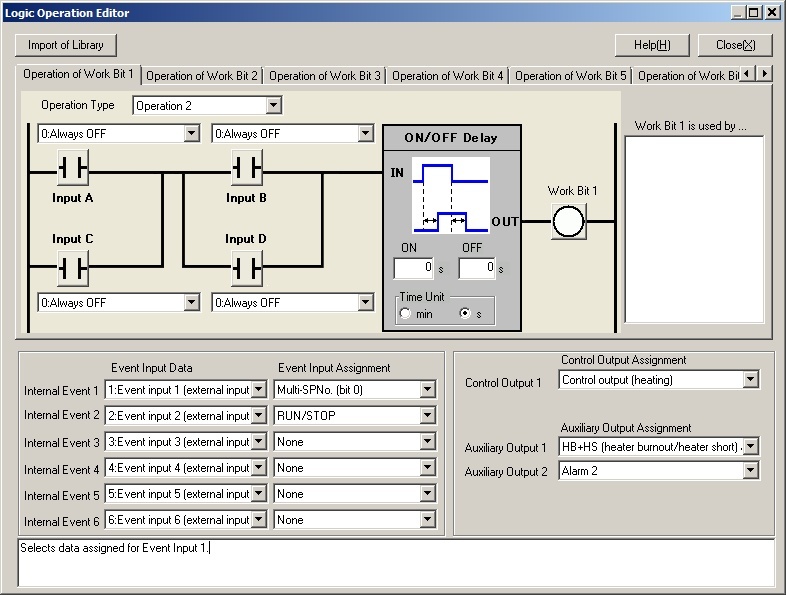 Additionally Profibus, Profinet and Modbus TCP protocols are supported. *1 Modbus is a registered trademark of Schneider Electric. With any model that provides a transfer output, you can output the set point, process value, manipulated variable, or other values as a 4 to 20-mA or 1 to 5-V transfer output. Program start time: Standby operation (delay) can be set. Repeating and linking programs are also possible. You can easily set the optimum PID constants for the current PID set or for all PID sets by performing AT (auto-tuning) with the limit cycle method. You can also add RT (robust tuning) to give priority to controlling stability. Especially in sterilization processes special customized temperature profiles are required. To destroy bacteria, viruses and spores a minimum temperature is needed which must be applied by damp for a certain time which could be quickly set-up by the E5_C-T programmer. Even RUN/Stop command can be carried out by the 1st Master Controller e.g. via 5th assigned “PF” button. In laboratory environment often different temperature profiles must be run. With changing surrounding conditions and different object characteristics E5_C-T can store your individual PID sets – and even if you don’t know the parameters Omron’s patented 2-PID auto-tuning algorithm is overtaking that for you. 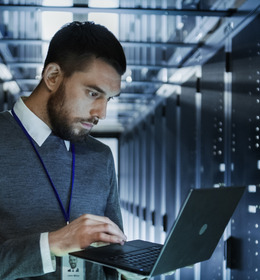 If you need to log your temperature curves on an external PC, the CX-Thermo software is helping you to track your data in an easy and understandable way. In many thermal applications (thermal forming, brick production, pottery, metal treatment and food production, etc.) several processing steps are needed with different dwelling points in each segment. At the end of each step or program the process stops or continues jumping to the next segment which is indicated in the display* (PRG/SEG). Alternatively you can set different steepness for the ramp-up/ -down period, e.g. allowing a soft decrease of temperature to avoid structural cracks of the heat treated object. All segment steps can be auto-tuned by only one command for all and needn’t be re-activated each time. With 40% MV (Manipulating variable) your sensitive object can be soft-tuned avoiding any bigger over-shots. This provides crystal-clear process status, even from a distance and without the need for interpreting the values. When one of the heaters is not within a set-point range the Process Value can start blinking alarming any operator. In plastics production the tool used to make the product is changed quite often. Frequent reconnecting of the sensor or heater can result in a wire break (a broken thermocouple, for example) – to avoid any unintended overheating a Loop Break Alarm (LBA) could detect such dangers switching off the machine in time. Furthermore a heater burnout (HB) or SSR failure could be reliably monitored in our models with SSR failure / Heater burnout alarm function. Following the electronic design of our E5_C platform, you naturally could also handle logic operations and timers in the E5_C-T programming family. You can save timers or even omit any soft PLC functionality when using this tool, which is available on every E5_C type.